Edamame is a the Japanese name for fresh soybeans! Take them out of the freezer, and microwave for 3-4 minutes in the microwave right in the package. and let everyone shell them as they go! Our kids love to eat this…I think they especially like picking them out of the pods. >Greetings! In keeping with the mission of XO Fitness to enhance your lifestyle, we’ve decided to introduce a new weekly food blog we call Friday Foodie. Ryan, Karin or one of our trainers will be sharing a healthy recipe that they love every Friday. Our intent is that these recipe’s are relatively easy, delicious and use the fewest pots and pans for easy clean-up. 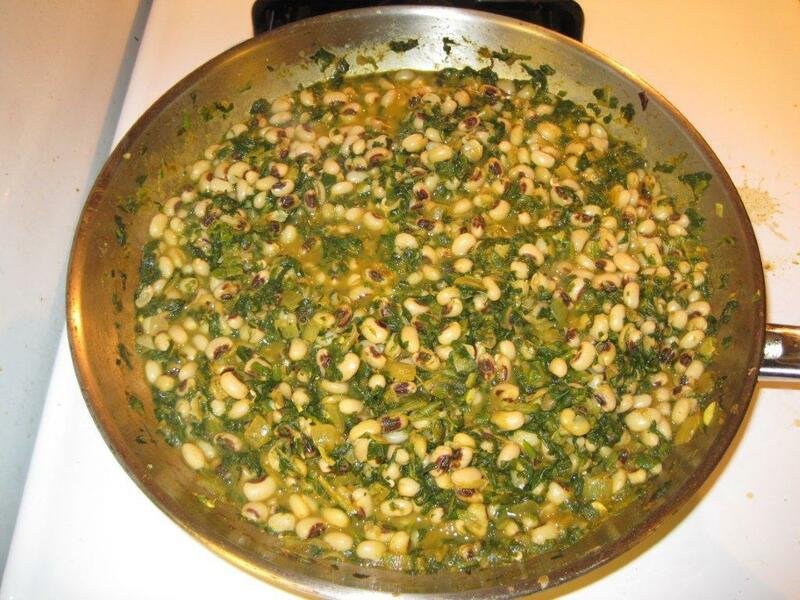 This week’s recipe is Spinach and Black-Eyed Pea Curry. 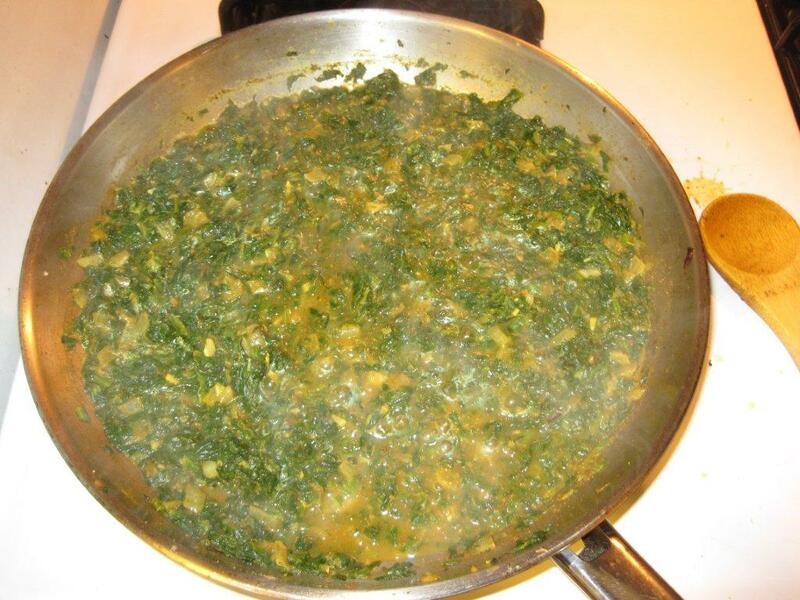 I’ve been making spinach and black-eyed pea curry ever since I first had it at a tiny Nepali restaurant called Himal Chuli on State Street in Madison about 15 years ago. Although I’ve never quite emulated the complex flavor, this recipe can be made as simple or as difficult as you choose and every variation is enjoyable. There are infinite ways of making the curry sauce; what follows is by far the fastest version I’ve made that takes only 20 minutes or so. -Ryan. 1 block frozen chopped spinach, defrosted. 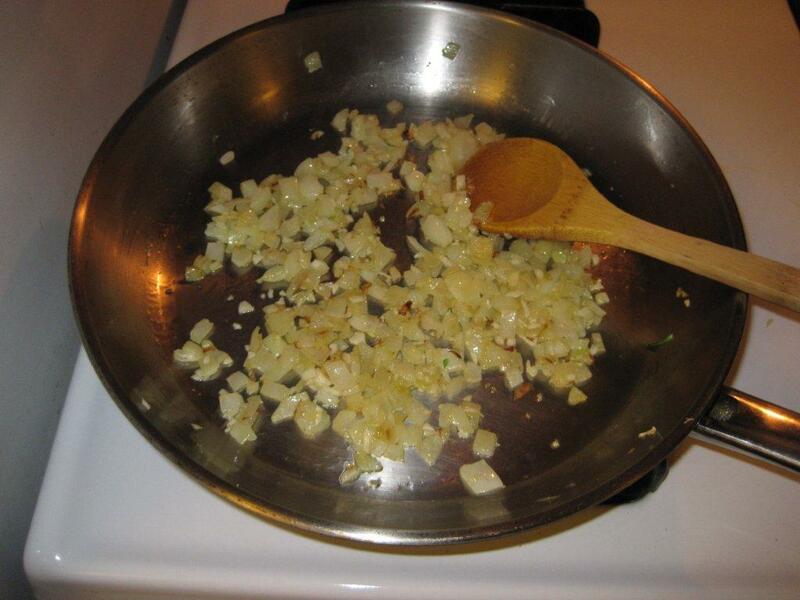 1 medium onion, small diced. 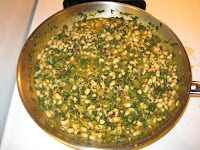 2 cans of black-eyed peas (15oz), rinsed. Step 1: In a Large frying pan, saute the onion and garlic in the EVOO over low heat, covered, stirring occasionally until onions are translucent and start to brown a little. Step 2: Turn the heat up to medium and stir in 1 cup of water and the curry paste, stirring until the curry paste is dissolved completely. Step 3: Mix in the defrosted spinach your drained, well rinsed (important!) black-eyed peas. Step 4: Cover and simmer on low heat 5-10 minutes, stirring occasionally. Step 5: Taste. Add more curry paste if desired by mixing with a small amount of water. Step 6: Thicken (optional). Mix the cornstarch into a small amount of water and mix into the curry. Stir over medium-low heat until sauce thickens. Step 7: Serve directly or over brown rice or quinoa. Makes great leftovers! Options: Often, this is made with cubed potatoes, which are cooked in the sauce. Another variation to up the veggie content is to add cauliflower florets, and simmer covered until thoroughly cooked. That’s it. If you divide it into 4 servings, it is about 280 calories per serving with 38 grams of carbohydrates, 11 grams of fat, and 7 grams of protein. It also includes 10 grams of fiber, or about 40% of the recommended fiber for a 2000 calorie diet and just 300mg of Sodium. I hope you enjoy this recipe as much as I have. Let me know if you make it and how you like it. Thanks! -Ryan. Cover 1/2 your dinner plate with steamed broccoli…. Start out your day with a scrambled egg and the leftover broccoli. >Americans are, in general, stressed out and the holidays just put the icing on the cake. According to the American Medical Association, stress is a factor in more than 75% of sickness today. Also, the World Health Organization states: Stress is America’s #1 Health Problem. Find a quiet place (even your parked car) where you can close your eyes and breathe. Try progressive muscle relaxation. In this relaxation technique, you focus on tension and relaxation. Start by tensing and relaxing the muscles in your toes and progressively working your way up to your neck and head. Tense each muscle group for five to ten seconds and then relax and move on to the next muscle group. Most people hold a lot of tension in their upper back, neck, jaw and face. You may not even realize that you are tense in those areas until you try this technique. Imagine letting the tension “melt away”…this really works great. Exercise. You just knew I was going to say that didn’t you? It doesn’t take as much time as you may think. Even a brisk 10 minute walk can help to clear your mind. Physical activity increases the production of endorphins, your brain’s feel-good neurotransmitters. Longer bouts of exercise (if squeezing them in does not stress out your schedule) are highly recommended. Cardiovascular exercises such as walking, running, cycling and swimming will all give you some “me time” which is great for sifting through your list and solving a problem or two. Another suggestion: relax, breathe and get re-focused with yoga or tai chi. Do you need to get totally distracted? Try a playing a sport or attending a choreographed exercise class which will keep you focused on the activity at hand with no chance to dwell on your problems. Visit www.xofitness.com to see our group training schedule. Have a Happy Healthy Holiday Season! Please visit https://www.xofitness.com/ for more information about our personal & group training services. Downtown restaurants and retailers will be offering great specials and collecting cans for The De Pere Christian Outreach Food Pantry. Cost: $10…there are only 100 tickets, get them while they’re HOT…tickets are available at many downtown restaurants and retailers! Downtown restaurants including Alpha Delights, Caliente, George St. Cafe, Great Harvest Bread, Hansen’s Dairy & Deli, McGeorges and The Vault will be serving soup along with other food and drink specials. You get to vote for your favorite soup!! Comments Off on >WAIT! It is NOT time to buy Halloween candy! >WAIT! It is NOT time to buy Halloween candy! It’s only September, but the trick-or-treat candy displays are out in full force! Be realistic, if you buy Halloween candy now will it actually be around on October 31st when the kids come knocking? I doubt it! Instead you or your spouse and/or your kids will have eaten it all up and you will have to go buy more for the trick-or-treaters. My advice, leave the candy in the store until just a few days before Halloween otherwise, stepping on the scale might get a little scary! Did your fitness routine go freestyle this summer? The trouble with summer is that people tend to be inconsistent about exercising. This happens for a multitude of reasons: a) the kids are home; b) week-long vacations and travel; c) relying on outdoor activities like gardening and walking for exercise. Schedule your exercise. Consistency is the key to success. “I am going to get in shape this fall” is far too vague. Instead, say “I am going to exercise for 30 minutes three days a week for the next 4 weeks.” You should consider being even more specific and schedule the days you will exercise on your calendar. Notice how this statement is measureable in couple of ways (minutes of exercise & days per week) it also has a time frame of 4 weeks so when you have successfully exercised through out the month of September you can reward yourself. Then you can set a new goal (maybe 4 days/week) for the month of October! 1) Write your goals. Post them somewhere you can see them regularly and act upon them. It is important to review your goals daily…for one minute. Spencer Johnson, M.D., in his book The One Minute Mother gives us this motivational quote: “I take a minute, I look at my goals, I look at my behavior, I see if my behavior matches my goals”. 2) Record your workouts. It may seem silly, but most grown-ups are just as motivated as grade-schoolers by something as simple as a chart on the wall with gold stars. Try this at home: Place a calendar which is dedicated to keeping track of your workouts in a prominent location such as your refrigerator. Everyday you workout give yourself a star on the calendar. You may also want to record your time, distance and/or the activities you completed.  Body composition (the ratio of fat to lean body tissue) is much more important. This can be measured with a skin fold calipers by a fitness professional.  Keep track of inches lost with a tape measure. Record your girth measurements around your waist, hips, and upper leg. Measure them again in one month. The tricky part is measuring the same spot the next time, so take good notes. For example, when you measure your waist pay attention: did you measure across your belly button or two inches above your belly button?  How many push-ups you can do without stopping, how many chair squats you can complete in 30 seconds and how long it takes you to walk/run a specific distance such as one mile (works best on a track)? Re-test every eight to twelve weeks and you will be impressed with yourself!  How many minutes and/or miles you complete weekly or monthly? Comments Off on >XO Fitness welcomes Ann Oviatt to their personal training team! >XO Fitness welcomes Ann Oviatt to their personal training team! Exercise is more than just burning calories, exercise can improve your quality of life, so keep moving! My mission is to educate others in the many ways exercise can improve their health and quality of life. For example: Exercise can lower blood sugar and blood pressure, improve bone density and even help improve some of the issues that come with cancer treatments – the nausea and fatigue, as well as the anxiety and depression that are so common. My decision to become a personal trainer was officially made when I found significant evidence of how exercise could have improved my grandmother’s quality of life – and nobody had ever suggested she do anything but “take it easy”. I spent several years as my grandmother’s caregiver while she was struggling with diabetes, complications from osteoporosis, and finally pancreatic cancer. While researching her general conditions, I found vague references about the benefits of “keeping active”, but not enough information in a useable form to be much use to me and my grandmother. Later, as I did more research to improve my own health and try to avoid the health issues that run in my family I kept coming back to fitness – strength, cardio and balance training. Ann will be available for trainings starting September 6th. >Many of us discover vacations and hot weather challenging our weight loss efforts this time of year. Relaxation definitely has its merits, but don’t let the lazy days of summer keep you from your health and fitness goals! o Keep healthy snacks handy in the car This will keep you out of the drive-thru lane. Having a pocket guide such as “Eat This, Not That” can be very helpful when you must eat on the run. o Limit your alcohol consumption There are a lot of empty calories in alcohol. It also reduces your inhibitions to eat junk food AND makes you feel hungrier. o Plan some physical activities Hiking, biking and swimming are great ways to get you moving. . If you have kids, keep them moving too. A study conducted by Ohio State University found that 5- and 6-year-olds gained more weight over the summer than during the school year, so shut off the TV and do something active with them! o It’s tempting to eat out when it’s too hot to cook If you do eat out, remember to eat reasonable portions, start with a salad and eat all your vegetables. Try to avoid fast food all together. o Eat fresh fruits and vegetables This is the BEST season for fresh produce…plus you don’t have to cook them. Whether you visit a farmer’s market or stop by the salad bar enjoy delicious fruits and raw vegetables EVERY day. Remember, the USDA recommends 3 servings of fruit and 5 servings of vegetables daily. o Drink Water Always a good idea…zero calories. Avoid drinking calories from soda, ice coffees, and sports drinks except as a special treat. Try squeezing some lemon or lime into your water if plain water isn’t appealing. o Stay cool in the pool Swim laps, chase your kids, walk in chest-high water or try deep water running for awesome low impact exercise. Want to lose weight this summer? Focus on eating well and staying active every day. >Walking is a fantastic low-impact activity which burns calories and improves your cardiovascular health. This 6-week program will begin slowly and then safely increase in intensity. You’ll learn the proper way to warm up before walking and the most important stretches to do when you are finished with your workout. You will be held accountable and motivated to increase your cardiovascular levels further than ever before! Getting outside this spring for this group workout promises to be fun and to keep you motivated to ensure you stick to the program and experience great results just in time for the Summer! $59 for 6-week training program (one day/week) That’s less than $10/week for your own Personal Coach! Dress for the weather, even in May you never know what Mother Nature is going to dish out, so dress in layers. If weather is really bad, we will meet indoors at xo fitness or identify a rain date. If you are registered to walk one time each week and need to switch from Tuesday to Thursday or vice versa just let us know.